Researchers from Lomonosov MSU, Faculty of Soil Science, have studied the resistance microorganisms have against gamma radiation in very low temperatures. The results have been published in the Extremophiles journal. Average temperature on Mars is -63 °C, but in polar areas and at night it can be as low as -145 °C. There is pressure lower 100-1000 times than on the Earth, strong ultraviolet and ionizing radiation. Until now, no one knew to what extent microorganisms can resist such extreme factors. By finding out the limits, scientists can assess the possibility of microorganisms and biomarkers surviving in various objects inside the Solar System. This information will become invaluable in planning astrobiological space missions, when it is important to carefully choose objects and regions of research, as well as thoroughly develop techniques for the detection of life. In their current paper, the authors studied the radiation resistance of microbial communities in permafrost sedimentary rocks under low temperature and low pressure. These sedimentary rocks are considered to be a terrestrial analog of regolith, the ground left after space weathering. 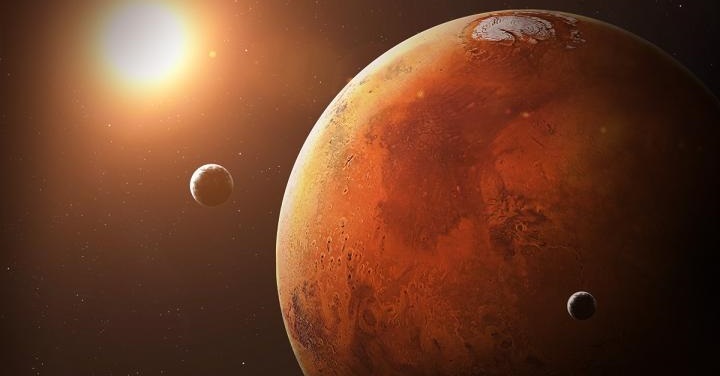 The scientists assume that the potential Martian biosphere could survive in cryoconservated state, and that the main factor limiting its lifespan is the cells obtaining radiation damage. By defining the limit of their radiation resistance, one can estimate the length of microorganisms surviving in the regolith of various depths. "We have studied the joint impact of a number of physical factors (gamma radiation, low pressure, low temperature) on the microbial communities within ancient Arctic permafrost. We also studied a unique nature-made object - the ancient permafrost which has not melted for about two million years. In a nutshell, we have conducted a simulation experiment that well covered the conditions of cryoconservation in Martian regolith. It is also important that in this paper we studied the effect of high doses (100 kGy) of gamma radiation on prokaryotes' vitality, while in previous studies no living prokaryotes were ever found after doses higher than 80 kGy", - one of the authors, Vladimir S. Cheptsov, a post-graduate student at the Lomonosov MSU Faculty of Soil Science, Department of Soil Biology, told us. While simulating these factors influencing the microorganisms, the researchers used an original constant climate chamber that allows maintaining low temperature and pressure during gamma-irradiation. Authors also note that natural microbial communities were used as a model object, not pure cultures of microorganisms. The microbial communities studied have shown high resistance to the conditions of simulated Martian environment. After irradiation the total count of prokaryotic cells and number of metabolically active bacterial cells remained at the control level, while the number of cultured bacteria (those which grow on nutrient media) decreased ten times, and the number of metabolically active cells of archaea decreased threefold. The decrease in the cultured bacteria numbers was caused probably by a change in their physiological state, and not by death. The scientists have detected a fairly high biodiversity of bacteria in the exposed sample of permafrost, although the microbial community structure underwent significant changes after irradiation. In particular, actinobacteria populations of the genus Arthrobacter, which were not revealed in the control samples, became predominant in bacterial communities following the simulation. This was probably caused by the decrease in dominant bacterial populations, so the actinobacteria of the genus Arthrobacter could be detected by the researchers. The authors also suggest that these bacteria are more resistant to the simulated conditions. There were also studies which proved that these bacteria have a fairly high resistance to the ultraviolet radiation, and their DNA is well-preserved in ancient permafrost through millions of years. "The results of the study indicate the possibility of prolonged cryoconservation of viable microorganisms in the Martian regolith. The intensity of ionizing radiation on the surface of Mars is 0.05-0.076 Gy/year and decreases with depth. Taking into account the intensity of radiation in the Mars regolith, the data obtained by us makes it possible to assume that hypothetical Mars ecosystems could be conserved in anabiotic state in the surface layer of regolith (protected from UV rays) for at least 1.3-2 million years, at a depth of two meters for no less than 3.3 million years, and at a depth of five meters for at least 20 million years. The data obtained can also be applied to assess the possibility of detecting viable microorganisms at other objects of the Solar System and within small bodies in outer space" - the scientist added. The authors have for the first time proven that prokaryotes can survive irradiation with ionizing radiation in doses exceeding 80 kGy. The data obtained indicate both a possible underestimation of the radiation resistance of natural microbial communities and the need to study the joint effect of a set of extraterrestrial and cosmic factors on living organisms and biomolecules in astrobiological model experiments. Hallo , met elektronen in cirkels uit martian [on zichtbaar net aks bij aarde of verborgen met harde korst en damp kring ]spectrum ,die weer kaatsten tegen protonen bol in centrum en verkleinen hun cirkels beweging tot dymenssien van atomen .In natuur moest ook bestaat element met massa structuur enige structuur dat kan zich verbreiden ,verkrampen en geperst [ door reactieve druk van de zon on voltooide implosie ,alles vullende ,koude ,doorzichtige massa [ inreactie met hitte elektronen krijg structuur ,vorm en kleur ] in subatomaire tot ruimte van clusters.Dan is reaal bestaat van atomen kwekerij op elke grotere object in universum .Atomen zich aan sluiten in molecule ,molecule in cellen ,cellen in organen en organen in lichamen of organisme .Natuurlijk alles is aanhankkelijk van omstandigheden . affordable dumpsters virginia Great detailed information, I ll be visiting you more frequently, here is very interesting information.